What can a taxi ride in an alien country really tell you? 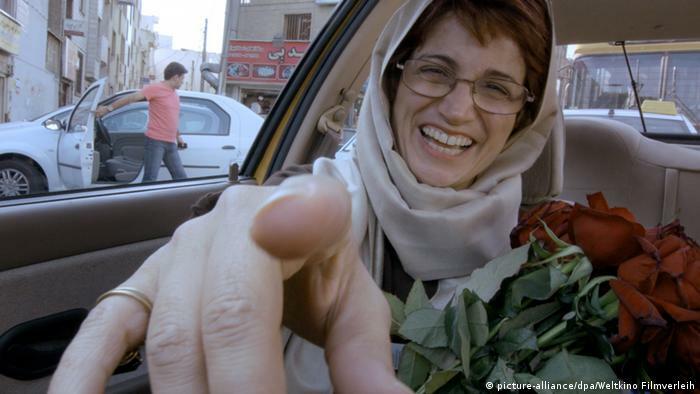 Not much perhaps, unless you take it with Jafar Panahi, the unconventional taxi-driver on the streets of Tehran, a critically acclaimed filmmaker, who has ceaselessly challenged the norm and made movies which sometimes show the Iranian government in bad light. He does it again in this film, despite a 20 year ban on filmmaking imposed on him by the government. The film can be called a found footage film, but that does not capture its experience. It is intimate, sure, but more than that it is comforting, as though the filmmaker, who also plays the taxi driver were saying to you, ‘welcome to my city, stick along and you will be safe’. Filmed mostly with cameras fitted inside of the taxi and a little girl’s(, who plays Panahi’s niece) amateur camera, Taxi Tehran/Taxi asks tough questions about the role of punishment; about antediluvian ideas which continue to govern us, and also about censorship in filmmaking, of which Panahi himself is a major victim. The Iranian taxi, it is known are of two types. One is the conventional taxi, which is hired by you directly to your destination. Another is a passenger-taxi which carries a lot of people, all of whom are travelling in the same direction. The passenger-taxi of Panahi thus becomes the microcosm of Iranian society, which not only shows Iranian people, but records their conversations, prejudices and superstitions. The theme of Crime and Punishment pervades the film, and starts off as a debate between a burqa-clad woman and someone who appears to be an archetypal patriarchal Iranian youth. The youth advocates stringent punishment based on the Shariah, and the lady seems to think crime is ‘the consequence of circumstance’. The conversation descends to a mansplaining-match thanks to the youth, who later stumps everyone by declaring that he is a pickpocket. Panahi thus normalises inanities, which are the reality in society. He meets an old-friend who has been the victim of a dacoity by masked men. The friend recognises one of his assailants as the waiter of a cafe he frequents, when his mask comes off during their altercation. But he still frequents the place, where this dacoit works as a waiter. The friend, like the burqa-clad woman understands that poverty of which he has no experience often motivates crimes. He pesters Panahi to make a film on the dacoity. A brief scene in the middle captures the aftermath of a road-accident, when Panahi’s cab is hailed to transport a fatally injured man and his wife to the hospital. The elderly-couple’s misfortune and grief is palpable and it is difficult to keep looking at the screen. The man beseeches Panahi to record him speaking his will, for he knows that if he dies intestate, his wife will inherit almost nothing. Panahi’s hijab-bound little niece is a great sweetener in the movie, who makes the most articulate of observations without any gravity. Panahi’s companion for a little more than half of the movies, she is an aspiring filmmaker, but realises how crazy censorship is, when her teacher assigns them to make a film, which would be both ‘in conformity with Islam’s values’(no stealing, no contact between man and woman etc) and at the same time ‘realistic’. Her frustration reaches a crescendo and she bursts like a little moral volcano on an adolescent rag-picker who picks up fallen notes, and does not return it, thus rendering the footage she recorded of him ‘immoral’. These conversations remind me of Sadat Hassan Manto, the Indian/Pakistani short-story writer who claimed to ‘write about the unabashed reality, without embellishing it with morality’, as a defence in obscenity proceedings against his works. As the movie progresses we meet a lady who appears to be a human rights lawyer. She is particularly warm towards Panahi, and they discuss his incarceration briefly. She is headed to meet the family of the protester, who tried to enter a men’s football match, thus flouting Iran’s outlandish law on woman being forbidden from watching men play sport. This footage appears real, and probably is. The lady recognises the camera in the car and lays one of the roses she is carrying under it, as though commending Panahi’s zeal of making movies in the face of a ban. Her wide grin and gregarious nature suddenly alleviates the pain of repression which has a subtle presence in the movie. It appears as though she and not the fairly reticent and self-aware Jafar Panahi is the real beacon of hope. The movie does not claim to be movie, it is an experience. The narrative tension is present, but does not leap off the screen. Sometimes one feels the urge to pause and reflect on a particular scene, more than moving on. The film really blurs the line between fiction and reality, to the point that it is difficult to commend acting skills, for the characters appear/are real. The sheer genius of the film lies in the way it sort of is a film and also not a film, for Panahi seeks to work around the ban in this ingenious way of filming a found-footage movie. But the bravery of the film lies in its challenge to state-repression. The wider theme it seeks to tackle is how the overthrow of the Reza Shah and the Islamic-revolution which overtook Iran in the 70’s has actually led to stifling of several freedoms, chiefly that of expression. And Taxi, does it in a surreptitious and unassuming way.